Boo Mario is a form of Mario that debuted in Super Mario Galaxy. As its name implies, the Boo Mario form is Mario disguised as a Boo, although his hat and face remain respective of his normal form. Boo Luigi, the equivalent form of Luigi, shares the same traits though with his respective features. In Super Mario Galaxy, Luigi has a sorrowful look on his face, though he does not in Puzzle & Dragons: Super Mario Bros. Edition. Luigi cowering at the sight of Boo Mario. In order to become Boo Mario, Mario must grab a Boo Mushroom. With this transformation, Mario can turn himself invisible and pass through certain walls and gates by shaking the Wii Remote, levitate by pressing the button, and descend by holding . The walls Mario can pass through as Boo Mario are similar to the ones he can pass through with Vanish Cap in Super Mario 64. 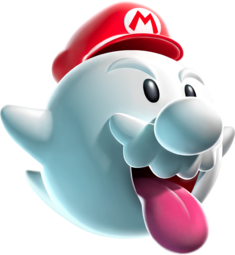 Mario can also understand the language of the Boos, called Booish, meaning signs written in that language can be understood by him once he transforms. His Boo form also attracts other Boos, causing them to follow him around and allow him to make use of them for various purposes. The transformation is lost if Mario takes damage, passes through light, touches water, or touches a Launch Star. Mario first uses this transformation in the Ghostly Galaxy to rescue Luigi. Because Luigi is afraid of ghosts, he cowers when Mario approaches him in Boo form; therefore, Mario must return to his normal form beforehand. It is also used in Boo's Boneyard Galaxy and Sand Spiral Galaxy. This power-up returns in Super Mario Galaxy 2, in the mission "Haunting the Howling Tower" of Boo Moon Galaxy, where the power-up is very widely used. Boo Mario and Luigi's equivalent form also appear in Puzzle & Dragons: Super Mario Bros. Edition. Boo Mario appears in Super Smash Bros. for Wii U as a trophy. As with most trophies in the game, it can be obtained when it appears at random in one of the game's modes, such as Vs., Trophy Shop, or others. Boo Mario makes an appearance in Super Smash Bros. Ultimate as a Novice-class support spirit, increasing the fighter's jump height and move speed but making them easier to launch when equipped. In the spirit's battle, the player faces an invisible Mario on the Dracula's Castle stage. Boo Mario's core can be combined with Ezlo's core to summon Cappy's spirit, or with a Shy Guy's core to summon Roger the Potted Ghost's spirit. In the deep recesses of the Ghostly Galaxy, strange and frightening spirits are after Mario. To help Mario navigate this scary place, he can grab a Boo Mushroom and power up to become Boo Mario! This allows him to become invisible, float like a Boo, and pass through walls. 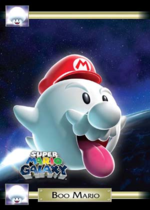 Wii Super Mario Galaxy 2 (05/2010) Are you afraid of ghosts? Maybe it will help to see the world as they do. Become Boo Mario with a Boo Mushroom, and then explore their world! Shake your Wii Remote to make Boo Mario go through walls. Boo Mario blends in OK, but even as a ghost he keeps his trademark hat. The other Boos don't seem to mind, thankfully. Boos are always tricky to deal with, so if you can't beat 'em, join 'em! All you need to do is grab a Boo Mushroom, and you'll become a Boo, letting you turn invisible, slip straight through walls and even speak Booish! You'd think Boos wouldn't fall for it, what with that trademark cap still firmly on top of your head...but luckily, they do. Boo Mario races the Spooky Speedster in Super Mario Galaxy. Boo Luigi in Super Mario Galaxy. Animated LINE sticker in which Boo Mario emerges from a defeated Mario. This page was last edited on April 17, 2019, at 19:43.